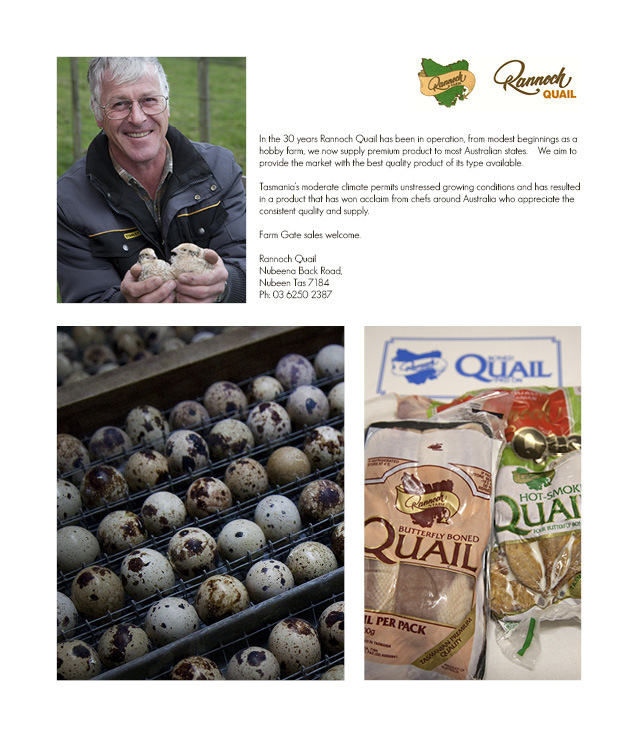 Rannoch Quail began as a hobby farm, and from those beginnings over 30 years ago, Rannoch Quail now provide premium products to most Australian states. With fresh and frozen quail available, Rannoch Quail aims to provide the market with the best quality product available. Rannoch Quail Farm is located in Nubeena and with the Tasmanian climate providing the ideal growing conditions, Rannoch Quail has won acclaim from chefs across Australia. The BCFM Committee warmly thank Rannoch Quail for their generous support of the production of the BCFM Cook Book – the recipe for barbecued quail below is so quick and is the perfect easy dish to cook outdoors when entertaining over summer – and it’s more impressive than a couple of snags! Rannoch Quail is available boned and butterflied which makes this lovely dish ever quicker to prepare. Located in Nubeena, Rannoch Quail happily provide farm gate sales, if you live in the area or are passing through this is a great option – contact details are below. Combine the soy sauce, vinegar, oil, sugar, ginger, water and garlic and pour into a dish that is large enough the hold the quail. Add the quail, turn over so that all surfaces are covered with the marinade, cover the dish and refrigerate. Although they become more flavoursome if left to marinate overnight, the quail can also be cooked immediately (if you do so, include the marinade in the pan when baking). Preheat the barbeque to medium high heat. Open the bird so it lies flat and place on the grill with the skin side up for about 10 minutes to seal the meat, then turn and cook skin side down about 10 minutes to crisp up the skin. Take care not to overcook the quail, it is cooked perfectly when the meat pulls back from the end of the drumstick leaving the bone exposed. Preheat the oven to 180°C. Remove the quail from the marinade, fold each edge of the bird under (as they are when they come out of the bag) and lay in a baking tray with the breast side up. Include the marinade for a stronger flavour. Bake for 15 minutes, turn the quail breast side down bake for a further 15 minutes. For a crispy skin, finish by increasing the oven temperature to 200°C and turn again, breast side up for 5 minutes. This basic recipe can be used in many ways and is especially good served with salad. See the Cooking Tip below for some salad ideas. Quail, pear, parmesan and rocket salad with a dressing of apple juice and balsamic vinegar. Quail, walnut, blue cheese and apple salad with honey mustard dressing. Quail, fresh berry and rocket salad dressed with raspberry vinegar. Quail, roast beetroot and goats cheese salad. For a hearty, winter dish, stuff the quail with bread crumbs, tarragon, sage, thyme, diced onion and crushed garlic, wrap the birds in bacon and bake in the oven for about 30 minutes.